Staff Sgt. Balinda O’Neal Dresel Nov 8, 2018. 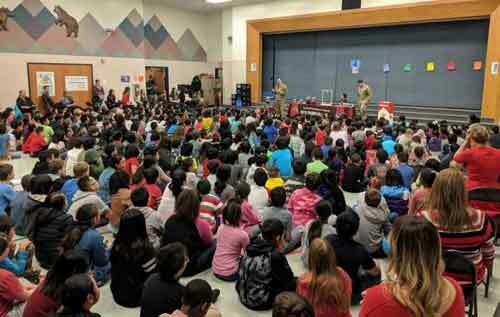 JOINT BASE ELMENDORF-RICHARDSON, Alaska – Members of the Alaska National Guard Counterdrug Support Program joined multiple law enforcement agencies to promote a healthy and drug-free lifestyle to students in Anchorage and the Matanuska-Susitna Borough during Red Ribbon Week 2018, Oct. 23-31. The United States Drug Enforcement Administration annual Red Ribbon Campaign is the nation’s largest drug prevention effort that has touched the lives of millions of people around the world for over 30 years. Students were greeted with excitement and high fives from the AKNG CDSP team, complete with a robotic police dog and a 10-foot tall inflatable “Guard against drugs” troop, affectionately known as Sgt. Drug-Free, as they entered the school. The assembly paid homage to the origins of the campaign that took shape in response to the murder of DEA Agent Enrique (Kiki) Camarena. Angered parents and youth in communities across the country began annual celebrations and wearing Red Ribbons as a symbol of their commitment to raise awareness of the killing and destruction caused by drugs in America. The prevention tools included inflating healthy and unhealthy pig lungs, a 5-foot fake cigarette with a list of up to 7,000 chemicals in cigarettes that can harm you, a jar of phlegm and tobacco teeth that all elicited looks of disgust on students’ faces. “By being a part of DEA’s National Red Ribbon Week, we support one of our adjutant general’s line of efforts, which is “Engagement with Alaskan Communities,” said Dean.